I've always had the inkling to be creative in one form or other, but Thurston Post is years of dreaming becoming reality. Inspired by everything colorful and pretty, I started making cards a few years ago. I’m currently exploring my new obsession: PACKAGING! I love assembling gift wrap kits and filling them full of handmade tags, trimmings, and decorated mini clothespins. I started paper-crafting about 8 years ago when the discovery that I was obsessed with it and even kind of good at it caught me completely off-guard. After being told by my middle school art teacher that he didn't see anything spectacular in the body of work I created that year, I pretty much gave up on arts & crafts and turned to writing. I wrote creatively for years and years, putting my vivid imagination (thanks, anxiety!) to good use and using it as an outlet--but not a money-maker (it's pretty difficult to make a living writing creatively). I meandered through different jobs, wondering what my true calling really was, and never finding it. Then I moved across the country on a whim in 2004 and stopped writing. I met my (future) husband and was shopping with him one day 2 years later when I spotted a store with the most gorgeous collection of colorful papers I had ever seen. Hues of greens and oranges and yellows and blues...all laid out on shelves that lined the back of the shop like a rainbow. I was in love. I was obsessed. PAPER was what I wanted to do! And now I'm here on my blog and on Etsy. With my little creative spaces. 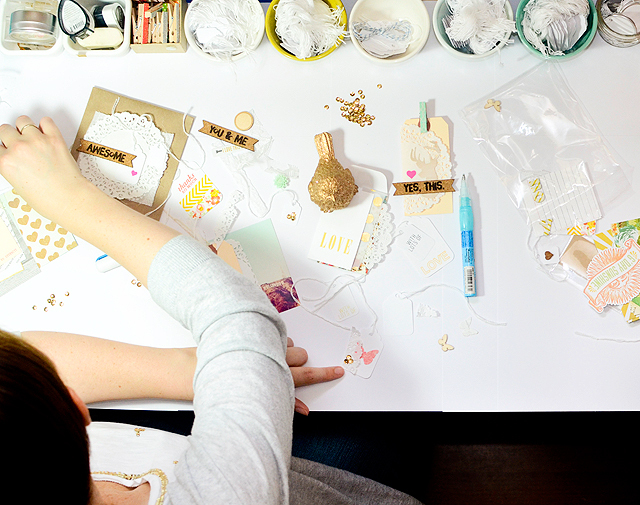 My blog is where you can see my Design Team work, paper projects (greeting cards, tag sets, home decor and DIY), and from time to time I talk about my personal and family life. That includes my husband (Hoss), 4 year old son Gus (aka Mr. Bagubian), and 1 year old daughter Anemone (Nemy). They keep me in check. My Etsy shop is ever-evolving, as am I. Never wanting to be one-dimensional, I work to add new and different types of items constantly. I love to look at pretty things and hope to fill the store full of pretty things I've made. Have an idea for something I should add to the shop or make for you personally?Message me and we'll chat about it! I am inspired by color. I have had a life-long love affair with 90's BritPop. I am terrified of spiders and stomach illnesses. I have lived with anxiety since I was a child. I live in Southern California but still consider upstate New York my home. I am really shy and quiet until you get to know me. Thurston is my middle name. Rebecca, your work is gorgeous. i saw your handcrafted cards in your Etsy store and instantly fell in love. Your artistry has inspired me, girlfriend... thank you. keep up the great work, Simone! Thank you, Simone! I'm so glad you like what you see and, even better, are inspired by my work. Please feel free to show me or send me a link sometime...I'd love to see your work! I appreciate so much that you took the time to comment here. Thank you!